The hotel is not far from the Champs-Elysées, the Arc de Triomphe and the Porte Maillot convention centre, and is close to the CNIT and the Grande Arche. The Metro line 1 is close by, giving access to the whole of Paris at record-breaking speed. (Station Esplanade de La Defense). Will allow you to move quickly between the Big Arc of The Defense and the main points of interests of the capital: Arc de Triomphe, the Eiffel Tower, the Louvre, Opera and department stores. Restaurant seemed very crowded for breakfast, cutlery was smudgy and sometimes with pieces of food on it, cups were OK-ish, coffee machines were smudgy and definitely needed cleaning. I had breakfast because I really had to. No rooms with the fridge. Positive experience was the bar and the service there. Basic but good value - shame no aircon. Room was comfortable but too hot with no cooling or opening window. Bathroom was clean and tidy. Room cleaning was good. Breakfast was also good. I arrived at 11 p.m. Despite I am a non smoker, I was offered a choice of either a smoking room or a room for disabled person (i.e. the shower did not have even a plastic curtain). The furniture in the room was old fashioned. The breakfast was with limited variety. This is for nearly 200 EUR per night. The room was clean and ok (not very big,but fine for short stay), the bed was very comfortable. The receptionists were so friendly, helpful and smiling - really nice to see in Paris. The room is basic but fine and clean. I stayed just for one night and it was okay. The stay was fine. I was on the 12th floor and the window could not open. I normally do like a bit of fresh air in the room. I have stayed at this hotel on a number of occasions when on business in la Defense. In a good location, comfortable hotel and good value. It was OK, but my impression of the room, was that it was extremely over due for a refurbishment. Decor was beige. I pick the hotel primarily for location, and the expectation of a reasonable room for a single night business trip ( I wasn't planning on getting too comfortable) . The room decor was dated and tatty. I was expecting in room ironing and coffee/Tea facilities. It was dated and too basic. I have stayed in other major European cities hotelfor similar rates, with modern decor and better basic facilities. The breakfast was very limited. Maybe the IBIS brand it too budget. Reception/restuarant staff great! In short, if I was staying longer in La Defense, I would not return to this hotel. Hotel generally quite expensive, but all works fine and it is clean and you are are been taking care of. Got this time a room on 14th floor and generally quite quite and calm with out disturbing noise. 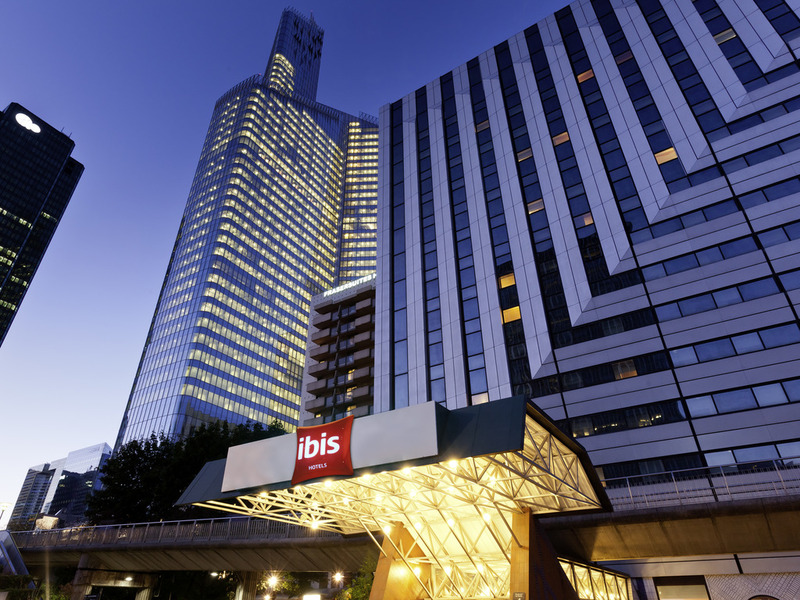 The hotel is in a convenient location for La Defense and the metro line. Room was clean. It would be nice if there were tea/coffee facilities available. Clean room and friendly staff at reception. Chose not to have breakfast so I don't know how it is. It's a little expensive but it is right near the heart of la defense so the real estate is pricey, of course. However, it's difficult to get to by bus. Better to take the RER or metro. Restaurant was good. Room was neat. People were friendly and helpfull. BUT, the matress I used the first night was crap. I felt like sleeping on a corrugated iron sheet, full of bumps and deeps. Fortunately, the second bed matress was ok, even if too soft for me. The thing is, an hotel is primarily to be able to sleep. And my sleep experience was not outstanding. Hotel is near metro station and has a beautiful view over La Defense. Rooms are small but with very confortable beds. I recived a room with facilities for disabled people but I didn't ask for that and for me was very annoying. Good breakfast . Room and breakfast all ok, air I wasn’t working tough. So quite warm during the night. Employees extremely welcoming and professional.